Economic losses from natural and man-made catastrophe events in the first-half of 2016 totalled an estimated $71 billion, of which $31 billion, or roughly 44% was insured, an increase of 51% compared to the prior year, says reinsurance giant Swiss Re. Natural disasters made up the majority of both economic and insured losses, while the number of lives lost in the period fell by 50% on H1 2015. Global reinsurer Swiss Re has released its preliminary sigma loss estimates for H1 2016 man-made and natural catastrophe events, which shows that the $31 billion of insured losses in the period is actually $1 billion higher than the ten-year average. Insured losses increased by 51% in the first-half of 2016 when compared with the same period in 2015, largely driven by natural disasters as both the economic and insured loss total from man-made disasters fell to $3 billion, says Swiss Re. Of the insured loss total, roughly $28 billion came from natural catastrophe events, an increase of 75% on the same period in 2015 and above the $26 billion ten-year average. 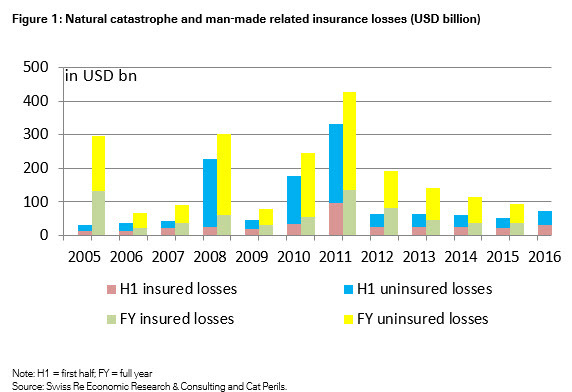 Analysis from the reinsurer shows that the total economic loss from catastrophe events in H1 increased by 38% on 2015 to $71 billion, although this is still below the ten-year average of $110 billion. Of this total, $68 billion, or 96% came from natural disaster events but again, this is below the ten-year average of $102 billion. The reinsurance giant states that as many as 6,000 people lost their lives to natural and man-made disasters in the first-half of 2016, a decline of roughly 50% on the reported 12,000 people that lost their lives in H1 2015 from such events. As shown by the above table, large losses from a diverse range of perils occurred in the first six months of the year, across varied regions. The two earthquakes that struck Japan in April proved to be the costliest in terms of both insured ($5.6 billion) and economic ($22-$48 billion) losses in the period, followed by a series of intense hailstorms and thunderstorms in Texas, U.S.
Swiss Re’s preliminary sigma study states that economic losses from the Texas events caused an economic loss of $3.5 billion, of which $3.1 billion was insured. Thunderstorms elsewhere in the U.S. and a series of storms and floods across Europe also contributed to increased economic and insured losses in H1, while the Alberta, Canada wildfire event was the fifth costliest insured event and third costliest economic loss event of the period. The percentage of overall losses that were covered by re/insurance in the first six months of 2016 actually increased when compared to last year, to 44% from 40%. While this increase may only be slight it shows how the occurrence of large catastrophe events in regions with higher insurance penetration results in a greater share of the loss falling on insurers, reinsurers, and increasingly insurance-linked securities (ILS) players. This notion is also emphasised by losses sustained following the 7.3-magnitude earthquake that hit Ecuador during H1, which was the deadliest single event in terms of lives lost in H1, and of which just $400 million was covered by insurance, says Swiss Re. But despite this, and the fact that the majority of large losses occurred in regions with higher insurance penetration, the realisation that less than 45% of the total economic loss was covered by some form of insurance highlights the global protection gap, for both mature and emerging peril regions. The chart below, provided by Swiss Re highlights the portion of insured and uninsured losses over the last ten years, underlining the need to improve global disaster resilience and the necessity of expanding the reach and capabilities of re/insurance and ILS solutions to all corners of the world. “The global insured loss total for the first half may be subject to revision. 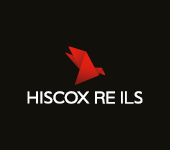 Any revision as well as the ongoing hurricane season in the North Atlantic could generate higher losses in the remainder of the year,” advised Swiss Re.